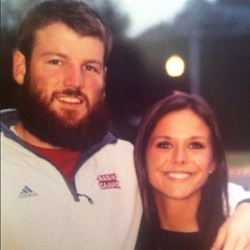 Hunter and Mary Katherine Bio - "Dancing with Kinesiology"
Hunter Stover and Mary Katherine Voitier are University of Louisiana Lafayette graduates. Hunter and Mary both graduated this past December. Hunter has decided to further his education and is currently attending graduate school at UL. Hunter is also the former kicker of the Ragin Cajun football team. Hunter and Mary are Ragin Cajuns at heart and embrace the Cajun culture. Allons Cajuns!! !